We recently caught The Animation Show here at the Music Box Theatre, on Southport Avenue in western Wrigleyville. We had no idea what a treat we were in for. 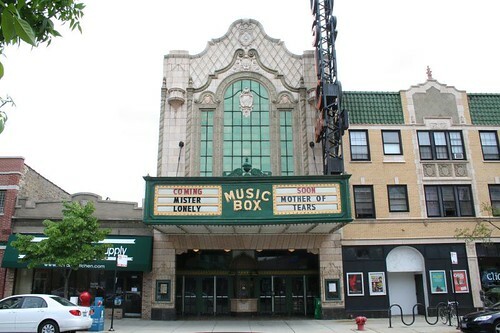 The Music Box is an old-time atmospheric theater, opened in 1929. Atmospherics had a flat auditorium ceiling painted to resemble the sky, which worked in conjunction with the decoration on the walls to create the illusion of being outside. In the Music Box’s case, it’s a cloudless evening sky, with tiny pinprick holes lit up to resemble stars (the lights even blink and dim to simulate twinkling.) The auditorium is designed to resemble an Italian palazzo. With the house lights dimmed, the illusion is surprisingly effective. As if that wasn’t enough of a treat, we entered to find that the house organ was playing at full tilt by a very talented organist. The man played for a good ten minutes while we waited for the show to finish; he wrapped up with a flourish to whole-hearted applause from the audience. The theater is of modest size for its time, seating “only” 800. 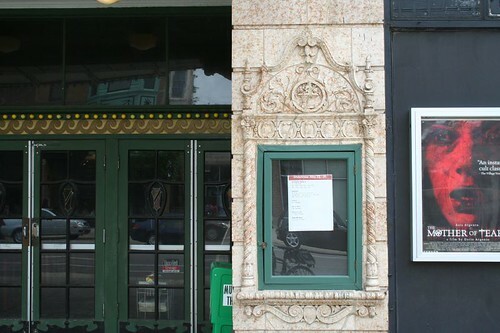 Unlike many surviving theaters from the period, the main auditorium has never been subdivided into multiple screens; instead a storefront was annexed to create a small second second theater, also in the atmospheric style. The two screens show a wide array of independent, cult and foreign films. The The Music Box Theatre website features original architectural drawings and some colorful history of the building and its staff. See also: The Music Box at Cinema Treasures. I hate that I’ve only been to the Music Box once. I had a grand time, at a performance of Rocky Horror.For a while, there were rumors that the Music Box folks were going to take over the shuttered Hyde Park Theatre on 53rd. Alas, the university decided they’d rather tear it down and try to lure the Gap into opening a store… Ugh. There should be projected clouds; maybe the machine was down?